It was that time of year again. The time of year for the kayak club to make its yearly pilgrimage to the seaside village of Lahinch, Co. Clare. Some say UL kayakers have been going to Lahinch since before kayaks began. Other more learned people say it’s closer to the last 30 years. The weekend started at our own boathouse with a flurry of last minute packing of boats, wetsuits and enthusiastic but nervous new kayakers. With everyone piled onto three buses and what seemed like 100 head counts we were on our way west to Lahinch. The hour and half journey felt like so much less than that with songs being sung and stories being told for the entire journey. By the time the hostel was reached everyone was assured of exactly what the hole in the Rattlin bog contained. A game of room roulette divided up the beds to ensure that everyone was making friends with someone new. The night continued with name games and after an exhausting night of getting names wrong everyone dropped away to bed with dreams of surfing some of the best waves in Ireland. Saturday morning most of the kayaking contingent was woken by a Leitrim man with an eagerness to kayak beyond our understanding. Soon everyone was fed, geared up, and rearing to go. We got into our kayaks, and after a prolonged struggle to shimmy off the sand everyone was tackling or being tackled by the best waves Lahinch had to offer. A variety of skill was on display for the Lahinch locals but we didn’t mind one bit. 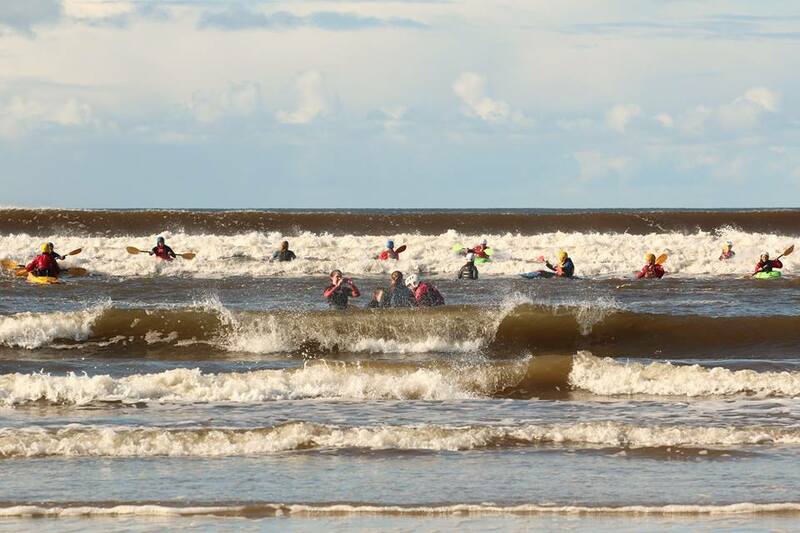 Everyone managed to surf a wave by the end of the session and that gave all the instructors a warm fuzzy feeling walking back up the beach at the end of the day. Saturday night was spent dressing up as every and any kind of criminal and heading to the local nightclub. We had some questionable costumes but ones that stood out for me were Donald Trump and Team Rocket from Pokémon. Sunday morning, we tackled more Atlantic coast waves after a lovingly cooked breakfast. Everyone was determined to improve on the previous days surfing performance. It was a real pleasure to see so many beginner kayakers improve between the two days and get hooked on the sport of kayaking. The journey home to limerick was a more relaxed affair with everyone being able to sit back and take in what a great experience the weekend had been. The trip was concluded with a mass clean-up of all the gear and everyone went home for a well-deserved, and probably long awaited, good night’s sleep! It was an absolutely amazing weekend. I hope you all had as much fun as I had. I can’t wait to see everyone for our next trip.